The tour starts in Dushanbe on Monday. The best way to get to Dushanbe is the twice-weekly (Wednesdays and Sundays) Turkish Airlines flights. The start of the tour is timed to coincide with the Sunday flight (arrives around 4am Monday morning). Alternatively, Tajik Airlines flies once a week from Munich to Dushanbe via Istanbul and Domodedova Airlines has a daily Moscow - Dushanbe flight. Please note that flight information is subject to change and you should check before booking. We appreciate that people join redspokes tours from all over the world and therefore no matter what time you arrive at the airport on the tour start date, you and your luggage will be transferred to the joining hotel. Please bear in mind that if you arrive before midday you may have to wait for your room to be available. 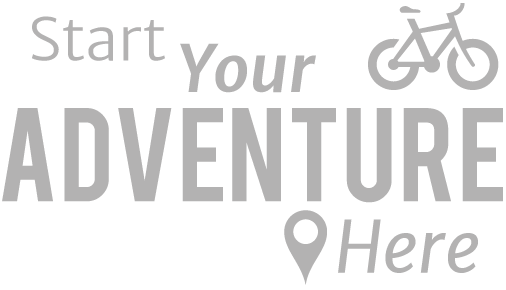 If you decide to arrive before the tour start date redspokes can assist you in booking your accommodation and will organise a transfer to your hotel at an additional cost. Our holiday price does not include your international flight. The tour ends 20 days later in Bishkek (Kyrgyzstan) on Friday. If you decide to stay in Bishkek beyond the last day of the tour redspokes can help you organise extra accommodation and transfers to the airport if needed. Check out www.kayak.com or www.expedia.comfor an idea of times and prices. You must be in possession of a valid passport and visa. Passport must be valid for at least 6 months after date of arrival or 1 month after expiration of visa. Travel to Tajikistan involves a certain amount of red tape and it is important that you allow enough time (around 4-6 weeks to be on the safe side) to obtain the necessary visas and permits. Visa for Kyrgyzstan.Since late 2012 Kyrgyzstan has allowed most nationalities to visit for tourist or business reasons without having to obtain a visa. Depending on nationality, no official invitation letter is now needed. Please note visa requirements frequently change and as such we advise that you check with the relevant embassies. Important: You will have to specify the start and end date for your Kyrgyz Visa. The start date should be no later than 15 days after the start of the tour. One to two months ahead of the trip you should visit your GP for advice on the vaccinations you require. Some of these may need to be administered a few weeks advance. As guidance only, you are likely to be required the following vaccinations: Diphtheria and tetanus, Hepatitis A, Hepatitis B, Measles, Mumps and Rubella, Polio, Typhoid. There is minimal risk of malaria along the route. Tough as the roads in Tajikistan can be rough. Low geared such as a 22-tooth granny cog on the front crank driving an 11-32/34 block on the back should do the trick. Comfortable as there are some long days so it is essential your saddle and riding position are comfortable. A mountain bike is a good option. Front suspension will help with the washboard tracks and potholes, but it is not essential. Full-suspension is OK, but may be hard work on the tarmac stretches. If you have flat bars, fitting bar ends will give you a different hand position and help with the climbs. The trip can be done on a traditional touring bikes, but it is important to ensure it has got strong enough wheels, sufficiently wide tyres (37mm is about the minimum) and low enough gearing. It's worth investing in a pair of 36 spoke, hand-built wheels, using a good quality rim (e.g. Sun Rhyno, Mavic or Rigida). Good quality waterproof jacket, waterproof trousers, warm hat (thick fleece), sun hat, cycle mitts, warm gloves, mountaineering gloves (waterproof outer, fleece inner) are good, mid-weight fleece top, 2 pairs cycling tights (looser, "trackster" fit rather skin-tight lycra), shorts, long sleeved shirt, travel trousers, 2 wicking t-shirts (synthetic or merino wool), cotton t-shirt for around town, long sleeved thermal top, thermal long johns, 2-3 pairs underwear, 2-3 pairs of standard socks, 1 pair warm socks, cycling shoes, e.g. SPD's, if applicable (bring spare cleats), trekking shoes, flip-flops, crocs or sandals to wear around camp. Sleeping bag. Other suggested items are: bike helmet, dark glasses (the sun is very strong), small day sack or pannier (assuming you have a rack to attach it to) to carry clothing, camera and valuables, a couple of spare passport photos, photocopies of key documents: e.g. passport (data and visa pages), GBAO permit, travel insurance policy, airline tickets, camera, photos of your family and postcards of your town to show the locals. - Camping in two person tents. - Village guesthouses, home stays and yurts. These are clean and comfortable, but quite basic. Typically, they have dormitory style accommodation (2-4 people per room), there may or may not be running water, electricity is intermittent at best and toilets are usually pit style at the end of the garden. All meals will be provided on cycling days. On non-cycling days breakfast will be provided. Food in Tajikistan is generally hearty and tasty. The staples are Plov, a risotto like rice dish with vegetables and a little meat, and Langhman, mutton soup with noodles. You can expect any meat to be fairly tough and stringy. The local bread and yoghurt are very good. Outside of the main towns there is little or no western food, i.e. no burgers, steaks or pizzas. Apart from apricots and watermelon, fruit is scarce. 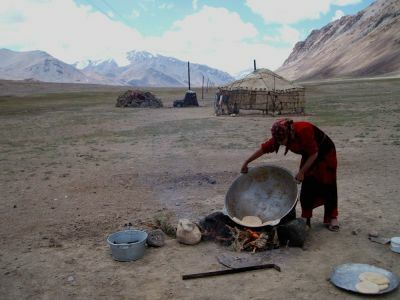 Although there is not much meat at the best of times, Tajik cooks struggle to cater specifically forvegetarians. The staple drink, is Chia or black tea. Fizzy drinks, such Coca-Cola, Fanta, and their Russian clones, are available in the towns and from the occasional roadside shop. The beer in Tajikistan and Kyrgyzstan is surprisingly good. Safe drinking water is not widely so we will be reliant on bottled water. There will be a joint kitty on tour for this, the costs of which should not exceed £10. If you are happy with the services of your guide and drivers we recommend that you leave them a tip. 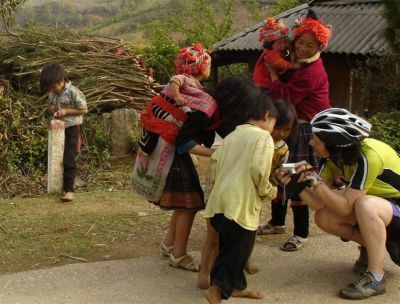 We suggest that each cyclist contribute 30-35 USD to the guide tip and 20-25 USD to drivers. If you want to follow the trip on a map, the best buy is The Pamirs 1:500,000 published by Gecko Maps available from www.stanfords.co.uk for £12.95. Healthcare in Tajikistan is very limited. There are few doctors and medicines are scarce. Please ensure you bring adequate supplies of any personal medication you require with you. We will be carrying a full medical kit but the following personal medical kit is recommended: sunblock (factor 30 or above), aftersun cream, lip balm, 1-2 courses of antibiotics to treat severe diarrheaï¿½see your GP for a prescription and advice on their use, Painkillers, e.g. paracetamol, 10 sachets oral re-hydration mixture, a few plasters, throat lozenges. Squeezed into inkblot shaped borders between China, Afghanistan, Uzbekistan and Kyrgyzstan, Tajikistan is one of the most remote and least visited countries on the planet. In the east, the country is dominated by the Pamir Mountains that rise to over 7,000m and boast some of the most spectacular peaks outside of the Himalayas. In the late 19th century the Pamirs, an unclaimed no-mans land of mountain tribes, formed the buffer between the outer extremities of the Russian and British empires. It was here that the "Great Game" was played out between Russian and British forces for influence over the region. Russia eventually prevailed and the area became part of the Russian empire. Following the Russian revolution, in 1924, Tajikistan was created as a republic of the Soviet Union with borders drawn out by Stalin's regime. In 1991, after declaring independence following the collapse of the Soviet Union, Tajikistan suffered five years of civil war that devastated its fragile economy. The country has been at peace for a decade now and is slowly rebuilding its economy. However, it remains one of the poorest countries in the world, the average wage being around $20 a month. Although it has a number of natural resources, the country has little industry to speak of and is heavily dependent on aid. The Pamir Highway was constructed by Soviet military engineers in 1931 to supply garrisons in what was then one of the most remote outposts of the Soviet empire. From Khorog to Osh, in Kyrgyzstan, the road snakes its way through the Pamir mountains for around 750 kilometres, mostly at heights of 4,000m or above. En-route the road passes through a landscape of snow-capped peaks, turquoise lakes and a wild Tibetan like plateau, studded with the occasional lonely yurt. Now that the Soviet military has pulled out the road gets very little traffic - a dozen or so vehicles on a busy day - and is a great adventure cycling route. Tajikistan's spectacular scenery is only surpassed by the hospitality of its people. It is the warmth of the welcome from the Tajiks that above all-else, makes traveling in Tajikistan a very special experience. Travel in Central Asia is never 100% predictable and this is doubly true for Tajikistan. Roads get closed by landslide, vehicles breakdown, petrol can be scarce, passes get closed by snow and regulations change at the whim of officials. It all adds to the adventure, but means that things rarely go 100% according to plan. Consequently, we ask you pack a little patience and flexibility. The best option is to bring most of your money in cash dollars (recent issue notes in good condition). Dollars are easily exchanged in Dushanbe, Khorog, Osh and Bishkek, and, at a pinch, they will be accepted in lieu of local currency.There are ATM's in Dushanbe, Osh and Bishkek, and traveler's cheques can be cashed in a few banks in Osh and Bishkek. If using traveller's cheques, make sure you bring your purchase receipts. Once out of Dushanbe, there is not much to spend your money on other than drinks and snacks, and generally these are very cheap. A budget of around £10 per day will easily cover these. Travel in Tajikistan and Kyrgyzstan is generally safe. The crime rate is low and there is little traffic on the roads. In the Pamirs, we will be above 4,000m for more than a week, so there is the risk of altitude sickness. However, we will be climbing to this height relatively slowly, over a number of days, which will allow for good acclimatisation. Even with good acclimatisation you can expect to feel some of the effects of altitude, such as headaches, loss of appetite and insomnia. In the Pyanj valley there are a number of minefields alongside the road. These are clearly marked and as long as you stay on the road there is no risk. The leader will brief you before entering this area. Road conditions in Tajikistan are generally poor and road protection, e.g. crash barriers and the like, do not meet western standards. Care is needed on some stretches, particularly the steep descents. We recommend you bring a helmet. A high proportion of Afghan opium crop is smuggled through Tajikistan en-route to Russia and Europe. This illegal activity has little impact on the tourist, but it means that there is a heavy security presence in the Pyanj valley, including numerous checkpoints and the occasional search. Visitors can expect every kind of weather in Tajikistan. In summer, the valley bottoms are very warm, with temperatures rising into the high 30s. In the mountains most of the time it is pleasantly warm and sunny, but severe sleet, snow and hail storms are not unusual. At night temperatures in the mountains can fall well below freezing. Tajikistan is primarily an Islamic country. Around 80% of the population are Sunni Muslims, however, in Badakhshan (the route of the Pamir Highway) most are Ismailis, whose spiritual leader is the Aga Khan. In general, the country carries its religion lightly. Dress is predominantly western and there are no requirements for women to cover their heads. However, dressing conservatively will ensure you don't offend local sensitivities. There is still a strong Russian influence in the country. A significant minority of the population is descended from Russian settlers and a good proportion of young people leave the country to find work in Russia. Tajik, the official language, is Persian in origin, closely related to Dari, Pashto and Farsi. Learning a few words of Tajik will go down well with the locals. Russian is widely spoken and, if you want to converse with the locals and get by in shops and cafes, it is probably a better bet than Tajik. English is becoming more popular, but at present very few people can speak it. Lonely Planet publish handy sized Russian and Central Asian phrase books. "Cycling through the dramatic landscapes of the Pamirs with barely any traffic all day (especially when on the plateau) and thinking it can't get better than this but it does..."